If you have any feedback on these demos, feel free to post it in this thread. covered by demos are very much welcome. However the example could have been better. I mean when you open a new tab to dynamically update, the entire point of the demo is lost. You could have just shown perhaps the clock updation, may be per 10 secs without leaving the page. Real world examples, may be like an auto suggest would have been better. Ah well.. good to see some solid AJAX support in IDEA. should be covered by demos are very much welcome. 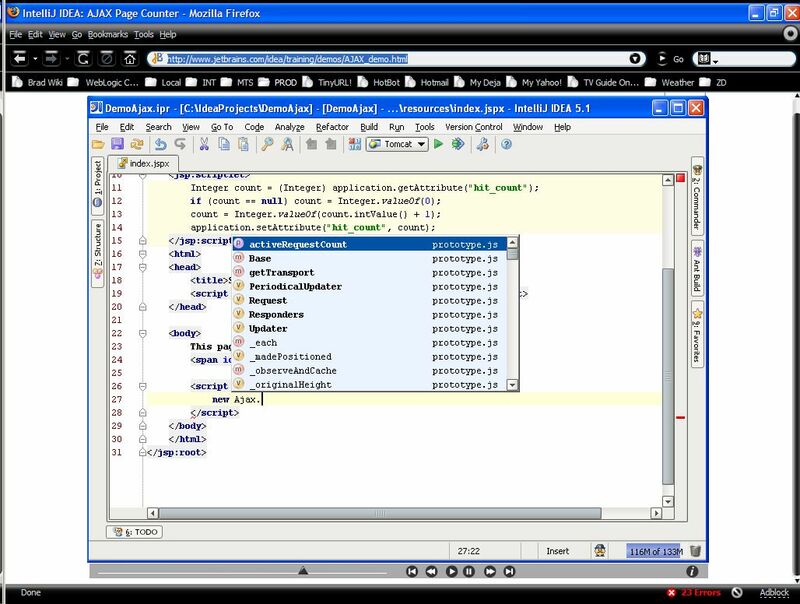 animated many people to start making Netbeans plug-ins (or using the platform). "rename" :). Let's say, one every week, and post it to Javalobby too :). dev, more demos ordered by functionality would be better than one big monolithic demo. and post it to Javalobby too :). There are some demos about refactoring (made for 3.0, but still valid). As for creating one demo once a week... Well, that's why we ask for feedback. It takes time to create a demo (and it is much faster to write some tip). Are demos indeed much better than let's say articles and tips&tricks? Yes, I know them, but IntelliJ has much more refactorings. Why not to make this really visible? info" link will direct the interested people to details. interesting information however, hence the rapid growth of their user base. Yes, at Javalobby we actually do this now. on the publication interval :). That's not very fair play from the other side :). A blog dedicated to IntelliJ's "cool feature of the week". Also these short articles/messages could be than reused for the "Tip of the Day". However, one should update it (and all the other jetrains blogs), not like the Onboard magazine. >> covered by demos are very much welcome. a demo. Just reopen the project or restart IDEA. In my case that helped. I'll really have no excuse for not internationalizing my applications any more ! Is that bug going to be fixed? Is there a Jira issue filed? You may need manually invoke file sync. If the problem is steadily reproduced then, please, file JIRA request. >>a demo. Just reopen the project or restart IDEA. In my case that helped. Nice ajax demo...but there is one thing I really don't like / wish it could be improved upon. Why doesn't the PeriodicalUpdater show up in FileStructure view? Can we get this to show up? I don't think that demos are better than written tips and documentation, although your demos are nice. I prefer to have something, which I can handle "offline" that is printing it and reading it when I am not at the computer. By the way, when is JetBrains willing to provide a documentation, which ready for printing - i.e. in PDF-Format? Since years I am asking for that. I you lokk at your help system it is not on par with that of other IDEs, notably MyEclipse IDE. 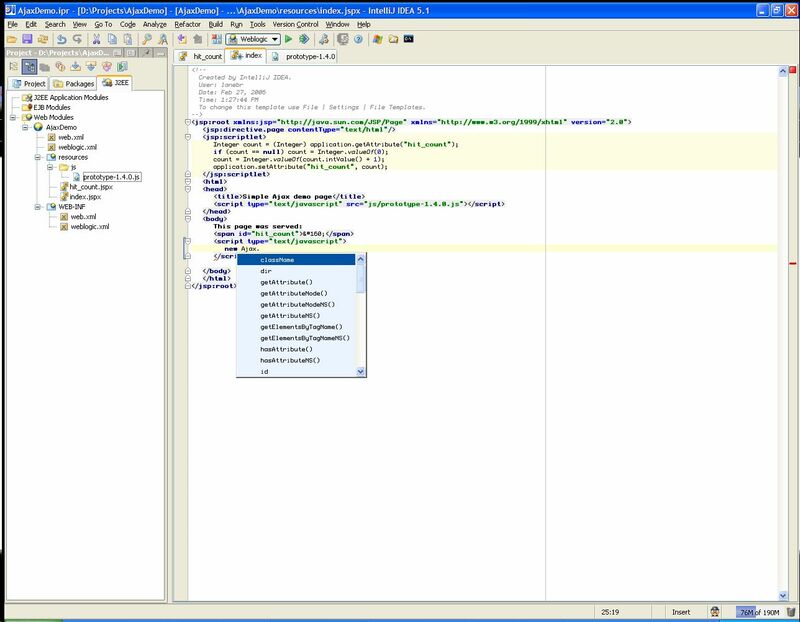 The IntelliJ help is not formatted to be printed on A4 size, the help window does not provide a print button, and you do not provide user's guides in PDF format. I would prefer, if you would spend your efforts on improving the documentation shipped with IDEA instead of producing isolated fancy demos for the web, which I may not be aware of and which I cannot access while I am offline (for example sitting in a train). So although the demos are nice, I feel they are more targeted to new customers while you neglect the need of existing customers, who are working with the product. Please to us a favor and provide documentation ready to print, preferable in PDF format. Or you could make the Manning publication IDEA in Action a PDF eBook, which will be maintained as IDEA changes and ship it with IDEA for buying customers. As for "written" tips you can check the new IntelliJ IDEA blog (http://blogs.jetbrains.com/idea/). print than the original help. We also publish some articles and how-to's at http://www.jetbrains.com/idea/documentation/documentation.html. how-to, feel free to ask. use IntelliJ IDEA for new technologies (like AJAX). in a train. Again, I hope the situation will change for 6.0 Release. reading it when I am not at the computer. button, and you do not provide user's guides in PDF format. access while I am offline (for example sitting in a train). maintained as IDEA changes and ship it with IDEA for buying customers. My best recommendation is to focus on application task project. I realized that Intellij is very powerful but most of its power go under utilized because features is too many and overwhelming and most user do not bother to go beyond the basics. I believe this is the best approach. I often realized that the help file is not useful. and Intellij in action make a better help file actually. Okay, to continue from last message, what I like to convey is that the company to focus on concentrating on the feature rather than tell what Intellij can do. Intellij can do many "interesting" stuff, what we needed is actually teaching us how to understand and use the "features" in a detail way. Most of the help file actually tell what it do but do little to demostrate how to use it . For example, the condition in debugging feature say what it do , but neglect what to put in. I guess this does not give justice to the amount of effort the Intellij developers put in developing the features. A features that is unknown and did not communicate well is as good as feature not there, but for marketing reason. I do suggest that Jetbrain put more effort in focusing on the feature know how rather than keep innovating without properly conveying the value and usage of those features. I guess Intellij is lacking in communicating the value. I don't think communicating the value should be bound to some particular version, and should be a replacement for creating new one.